The KTM Route Map (Laluan Peta) below shows the two railway lines in Peninsular Malaysia where KTM ETS (high speed Electric Train Services) and KTM Intercity and Shuttle Train services operate. Click on the station name link below for more information about the train services from that particular railway station. All long distance Intercity Express Trains on the North - South Railway Line have been cancelled from the 19th May 2016. 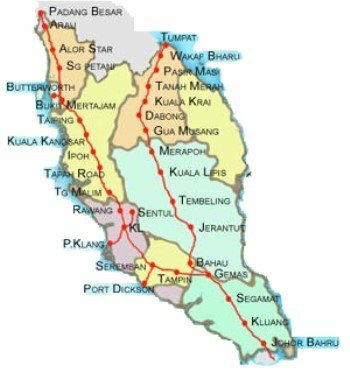 All long distance trains between Padang Besar and Gemas are now operated by ETS high-speed Electric Train Services only. New Shuttle Trains now connect with the ETS services from Gemas to Johor Bahru.